The offspring of the Maltese and a Poodle is known as a Moodle. 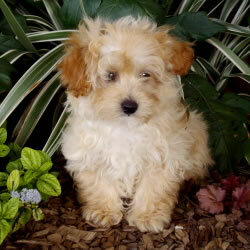 However, these puppies go by a wide variety of names including the Maltipoo, and even Malt-a-Poo. The Moodle is generally around a 25cms tall and weighs approx 5kgs. These adorable little dogs can vary in colour from black, white, apricot, buff, and grey, depending on the colours of the purebred Poodle and Maltese parents. Their coats are very fine and soft, frequently with a gentle wavy curl. The coat is generally low to non shedding. 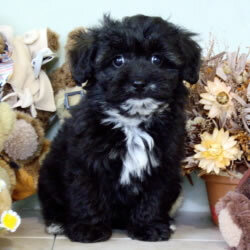 As with many hybrid dogs, the Moodle puppy is likely to be any combination of the Maltese and Poodle in nature. Moodle puppies tend to be extremely sweet and affectionate animals with lots of energy. They are extremely loyal and highly intelligent. If you socialize these dogs with other dogs, cats, and children, they are excellent with all three. Believe it or not, these little animals are frequently used for therapy, often they seek out those that are ill, and are very affectionate towards them. However, they are not great guard dogs, obviously. Honestly, this is a great dog for families with children and teenagers of all ages; they tend to love everyone they encounter, people and animals a like. 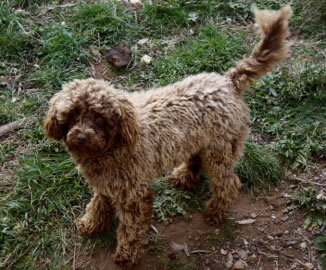 Moodles have low-shedding, low-dander coat dogs. Shampoo every 2 weeks, or as needed. Brushing is a great bonding activity and can be done regularly. Clipping 3 to 4 times per year, usually so that the dog has a fuller coat in winter and a shorter coat in the summertime. Exercise needs are moderate. If the home is a unit or has a smaller yard, the Moodle will require some walking or activity in the park. Training is relatively easy with these eager-to-learn dogs. When training, keeping the diet plain and having a very special treat for a reward is the best method. Moderate, indoor and outdoors in safe open areas. 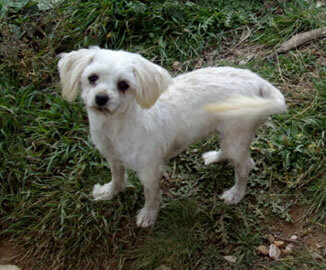 Given this is a hybrid dog the health issues are greatly reduced. 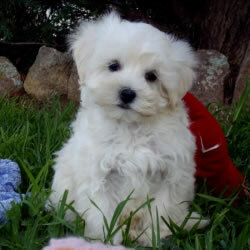 However the pure Maltese & poodle can be prone to various health concerns , such as knee, hips and eye problems. It is important that the breeding parents do not have these problems and are not producing puppies with these conditions.